Does Saint Thomas Regional School offer tuition assistance? The school offers tuition assistance from diocesan and parish resources. Please click here for additional information. What grades are served by Saint Thomas? 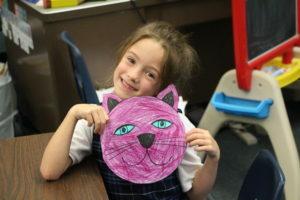 Saint Thomas School provides classroom education from Preschool through 8th grade. How many students are enrolled at Saint Thomas Regional School? Our school offers a smaller student:teacher ratio which guarantees more attention to each individual student in the classroom. Does my child have to be Catholic to attend Saint Thomas Regional School? If no, are we eligible for financial aid? All students are eligible to apply for tuition assistance. Are there full-day PreSchool and Kindergarten Programs? There are full day Preschool and Kindergarten programs. Preschool is now accepting ages 3+. Kindergarten begins at age 5. Yes, there is a middle school program. Yes, a hot lunch program is offered. The day begins at 8:00 a.m. and ends at 2:20 p.m. for all grades Preschool to 8. Yes, the school requires a spring/fall and winter uniform. Please click here to learn more about uniforms. Uniforms can be purchased through Donnelly’s in Providence. How safe are students and teachers at Saint Thomas? Safety and providing our students with the very best education are top priorities at the school. Access to the school is controlled at all times. No one may freely enter without first obtaining permission from the office. Those without appointment or unknown to administration are not permitted in the school at any time. All visitors must first identify themselves through the use of an intercom and security camera. Only when the visitor has been identified are they permitted entrance beyond the locked exterior doors of the school. Are Athletic programs offered at Saint Thomas Regional School? St. Thomas School actively participates in Catholic Athletic League Cross Country, Basketball and Soccer. 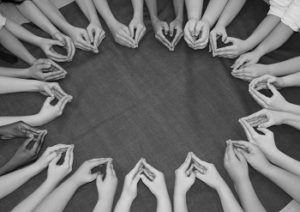 Yes, we hold several engaging after school activities in rotation throughout the year, such as: Band, Voice lessons, Art club, Algebra club, World Languages club, Lego Robotics, Drama Club, Martial Arts, Dance etc… There are also Class officers for upper grades and CAL athletics. Is it possible to schedule a tour of Saint Thomas Regional School? We welcome any parents who are considering Saint Thomas Regional to visit the building and meet with our wonderful teachers and students. St. Thomas School also invites prospective students to spend a day at the school partnered with a student in the grade they would enter. Why should I send my child to Saint Thomas Regional School? Saint Thomas Regional School educates and nourishes the total child: spiritually, academically, socially, and emotionally. Through active practice of the corporal works of mercy, our students do as Jesus did: love God and our neighbor. St. Thomas offers a challenging curriculum that strives to meet the needs of various learners. Our school is a close knit community with programs that seek to develop each child’s full potential. By introducing our students to various forms of expression we invite them to explore and find their gifts. Do parents pay for textbooks? Rhode Island State Law mandates that textbooks are provided by the cities and towns of the students’ residence. Legislative measures are introduced from time to time that would cancel this mandate, however Saint Thomas and the diocesan schools’ office regularly remind state leaders of the millions provided each year for public school teachers and students thanks to Catholic Schools. There is a small fee for supplies, workbooks and technology for each grade. Is bus service available for Saint Thomas Regional School students? Yes, Saint Thomas is a regional school that collaborates with the statewide busing program which provides bus services for the students located in our region. Is Saint Thomas Regional School an accredited educational facility? Yes, the school is accredited by the New England Association of Schools and Colleges. We are also a certified S.T.E.A.M. school! What does S.T.E.A.M. mean? Our school actively integrates Science, Technology, Engineering, Arts and Math (S.T.E.A.M.) into its curriculum.